Born in 1945, lives and works in Tripolis. Awad Elkish as student at Vienna. Awad Elkish was born in Bengazi (in 1945) where he went to school. Already early on it was clear to him to become a cameraman. In the 1960s he completed a practical training period in this field with the WDR (Westdeutscher Rundfunk) in Germany. 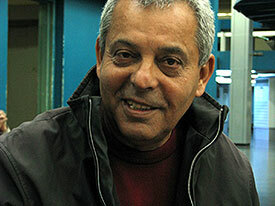 After returning home to Libya he first worked for Libyan television as a cameraman and documentary filmmaker. Not being satisfied with his work which seemed, to him, to be too limited he applied for another grant in Austria. 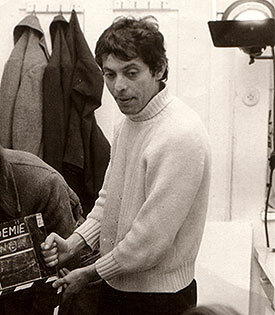 During his eight-year stay in Vienna, at the Austrian Film Academy with professor and director Alexander Corti, he registered for direction, film script, camera work, lighting, editing and received a good education. After completing his studies he stayed in Austria and made several lowest-budget films about social topics: about Muslims in Vienna, about young offenders’ imprisonment in Austria and about a blind shepherd fighting bureaucratic harassment inflicted on him because he wanted to try and live independently with sheep farming against his neighbors’ wishes in his home community. Back again in Libya he acted as director and head of the production department for the Libya Cinema Organization as well as an instructor. Together with Taher Abani, the brother of painter Ali Abani, he enlarged the new department for film and television at the faculty for media and applied art of the al-Fateh University in Tripolis. This was followed by five years of supplementary studies at the Vienna University for Music and Performing Arts. He then stayed for one year as a NLP (Neurolinguistic Programming) practitioner at the Austrian Training Centre in Vienna and attended further seminaries with Robert Dielt (Modelling with NLP, Skills for the Future). Today, Awad Elkish is fluent in German and knows all about European cultural life. After having returned to Libya for a third time, he again took up his activities at the al-Fatah University. Now he was able to pass on his knowledge of direction, film script and camera work to younger people. Projects of his own he consciously put on the back burner in order to accompany the film production of his students. It was clear to him that the subject production needed support. Only in this way he could best have an effect on the evolution of film in Libya. Apart from that he was the head of production of two German television documentaries. Today he’s mainly active in imparting culture. Elkish believes that a new generation has to carry on with film in Libya now, also because new working conditions and other possibilities of filmic expression have come into being along with the new technologies. The production of feature films in Libya is very rare. Most films made in Libya are television documentaries watched at home. Libyans are quite happy to be at home. There aren’t many cinemas in Tripolis anyway, and the few there are put an increasing emphasis on international and thematic festivals. Awad Elkish sees the future of Libyan movie houses in the developing into houses of culture that attend, apart from other areas, to the dissemination of the domestic film production and the imparting of foreign filmic creations.